Since 1978 Yunnan Tuocha Tea has been exported exclusively to France from China and now we’re excited to bring it to you in Australia! It’s not a fad tea that promises you the world – we have over 3000 years of wisdom and history going into each cup so we’re very confident that not only will you enjoy the flavour but you will be amazed by the positive impact it will have on your health. As early as 1066 B.C. the natives of China’s Yunnan province cultivated tea and served it as a tribute to the Chinese emperors. Yunnan situated in southwest China is the home of the famous tea mountains where this prized tea is grown. The Tea-Horse Road served as the lifeline between the remote villages of China and the nation of Tibet. The road stretched almost 2,500 miles through China’s Yunnan and Sichuan provinces and the Tibetan Autonomous Regions. Trade was lively and beneficial for both regions. Tibet had an abundance of horses, cows, and furs that were in high demand within China and in return the Chinese sent their tea, salt, and sugar along the road back to Tibet. The Tibetan people prized the tea for its rich flavour and health benefits. All classes of Tibetans, from the nobles to the common man, became avid tea drinkers. Tuocha was known for its ability to aid digestion and it was especially valued for the way it helped eliminate the effects of fat from a diet rich in animal meats. Tuocha was a tremendous success for the Yunnan Province – the trading of this tea continued along the Tea-Horse Road for many centuries. The production of Tuocha happens high in the mountains of Yunnan Province where the winds blow cool and the rains fall often. Labourers have toiled here for centuries to produce the rare and rich tea from a large leaf tea tree that thrives in the rich mountain soils of southwest China. For over three thousand years the fertile land has produced this sought after tea, with many of the tea producing trees today aged more than several hundred years old. Most of the tea growing takes place at elevations between 700 and 1,700 meters. The mountains provide the perfect setting for growing the perfect tea. A monsoon season, lasting from about May to October, provides an abundance of moisture in a concentrated period. This season is also the hottest period of the year, with the rain offering great protection to the valuable trees. Up to 150cm of rain falls during this period allowing the roots to dig deep and the tiny shoots to develop strong, healthy fibres. Following the monsoon season, from November through April, the gentle sun becomes the life-giving force. The leaves of the tree now have time to put their stored moisture to good use, and develop into healthy, flavourful leaves. Leaves from different trees vary in the time they take to mature which allows a harvesting season to lasts from March to November. 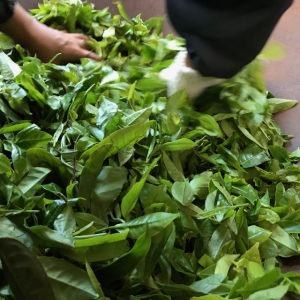 The process of producing Tuocha is much the same today as it has been for centuries. The tender leaves are picked and then they are partially fired using a large wok. This step, also known as “kill green” stops the activities of enzymes and determines whether the end result is a green or a black tea. The skilled hands of the growers next knead the leaves to breakdown their cellular structure. This releases the tea’s powerful flavour and spreads it throughout the leaves. Young leaves require little kneading to release their flavour. Older leaves are kneaded longer to ensure a full release of their hidden flavours. Once the leaves have been partially fired and kneaded they are returned to the care of the gentle mountain sunshine. The process of sun-drying the leaves locks in the precious flavour of the leaf. Once this step is completed the fundamental flavour of Tuocha is secure, and the growers can move to the next step in the process. This large-leaf species of the tea plants offer the richest juices for producing Tuocha and once gently sun-dried, are perfectly suited for the fermentation process that produces the tea. This special fermentation process occurs because the sun-dried tea retains its active microorganisms that set Tuocha apart from Black and Green teas. Once the fermentation process is complete the tea is compressed into small bowl-shaped forms and this is where Tuocha gets its name – the literal translation is Bowl Tea. The final step in the process requires patience. The bowl-shaped tea leaves are allowed to age, typically stored in special rooms or caves, some for months and some for several years. This process enhances the locked-in flavour of the Tuocha, resulting in an amazingly unique tea. So whether you’re at home, at work or at the end of a long journey like in the days of the old Tea-Horse Road, true tea enjoyment is now close at hand; so in the tradition dating back thousands of years, sit back and enjoy this dark, rich gift from the lush tea mountains of Yunnan.